University of California health and maintenance workers from the American Federation of State, County, and Municipal Employees 3299 voted to strike for the second time this year with 96 percent support from union members. 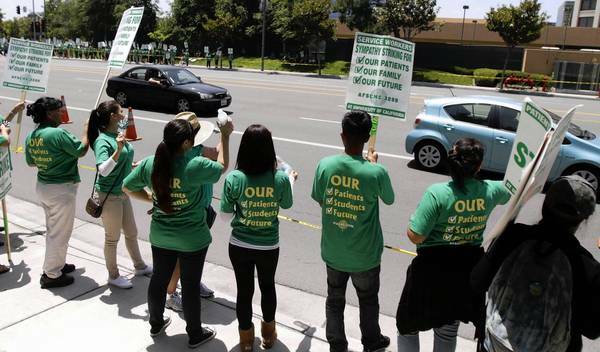 The strike comes after over a year of stalled negotiations between the UC system and workers represented by AFSCME, which includes 13,000 health workers throughout the system’s ten campuses. The two parties have been unable to reach a contract agreement due in part to an increase in mandated pension contributions for employees from 5 percent to 6.5 percent, which will mean less take-home pay initially. The union’s president, Kathryn Lybarger, believes that the UC administration has used unlawful practices to coerce employees into working for low wages and reduced benefits, leading the union to file a complaint with the Public Employment Relations Board. “Our members have engaged in good faith bargaining and offered meaningful compromises designed to build ladders to the middle class and make UC facilities safer for students and patients,” Lybarger said. “UC’s response has been to illegally intimidate and bully the front-line workers who serve the public. Representatives from the UC system contend that a PERB hearing does not indicate any wrongdoing on the health system’s behalf, as the board is required to look into all labor disputes. UC Vice President of Systemwide Human Resources and Programs Dwaine Duckett gave a statement on behalf of the administration, which issued its final offer on wages over the summer. Both the union and the UC administration have accused each other of actions that result in fee increases for students and patients. UC believes that an across-the-board wage increase for AFSCME’s workers will inevitably lead to higher premiums for patients and students enrolled in SHIP. However, AFSCME has argued that the health system has already leaned too much on students to alleviate its debt, while awarding top-level executives with salaries of upwards of $250,000. AFSCME went on strike for two days in May of this year, costing the UC health system $20 million. In September, the union’s service workers held demonstrations around campus by banging pots and pans in protest of low pensions, that, according to the union, total $20,000 for over 20 years of work. According to Duckett’s statement, the California Nurses’ Association, which is in the midst of its own contract negotiations with the UC system, intends to hold a sympathy strike in conjunction with AFSCME. No dates have been set for the strike, but AFSCME can call one anytime provided that they give a 10-day notice.